We are about to discuss its revelations! I’ll be honest with you, gang, this is the weakest issue of the current run thus far. Now, this run has been super good, so it’s a high bar, but even setting aside that comparison, this issue is okay at best. A lot of it is due to the art. What I’d feared a few weeks back has come to pass. Fill-in artists are a hit or miss game, and Jesus Merino and Andy Owens have missed with this one. The entire issue falls flat visually, with bland design choices that left me feeling like I was reading a comic from the mid-90s. Wonder Woman was drawn inconsistently, the design for Nemesis was uninspired (she’s a spider, I guess? ), and everything just seemed out of sync with the rest of the run. So many little things were noticeably off. Veronica Cale’s hair, for example. It’s a small, insignificant matter, really, but she didn’t have bangs two weeks ago and now she does. It’s a continuity failing that’s exacerbated by the fact that Merino and Owens are not particularly good at drawing bangs, either. Her hair looked terrible, and there was nothing else in the book to counter the many poor artistic choices. I wish the editors would put more effort into the book’s art, especially with G. Willow Wilson writing such a good run. Double shipping has been the bane of the artistic world for years now at DC, with so many books looking subpar because of the breakneck schedule. But DC makes it work for some titles! Batman always looks good. If it’s not Mikel Janin, it’s Joelle Jones, or Tony Daniel, or Clay Mann, or Lee Weeks. They find artists who fit each step of the story, and clearly plan things out well. There doesn’t seem to be that level of planning with Wonder Woman. Cary Nord obviously got overwhelmed by the schedule quickly, and we haven’t seen him in a while now. Xermanico was a great fill in, and Emanuela Lupacchino’s issue was a delight, but this outing has some bad art that just doesn’t match the caliber of what we’ve seen before, nor does it feel like it’s part of the same story. The writing this week wasn’t as enjoyable either. It was better than the art made it look, certainly, but the story felt a bit repetitive. We’ve got Wonder Woman fighting a god, again. We’ve got a villain trying to make her feel bad for being a superhero while making some interesting points, again. As much as I love the interrogation of heroism we’ve seen in this run so far, Veronica Cale’s angle was less compelling than Ares’ approach earlier on. Also, we know how angry Cale is. With Ares, there was a bit of mystery. We didn’t know why he was there or what his angle was. Cale’s just super mad at Wonder Woman, and trying to tear her down because of the powerful grudge she’s held since her daughter was taken from her. Knowing all of that, it’s hard to put much stock in her critique. Nemesis reveals that the realm of the gods has been destroyed as well, which is why Cale is extra upset. No gods means no Amazons means no daughter, so she’s understandably angry. Both Nemesis and Cale tell Wonder Woman that the Amazons are gone, and for some reason she just accepts it? I know we need to end the issue on a dramatic moment, and Diana flying off with tears streaming down her face offers us that, but I feel like our gal is smarter than this. Wonder Woman’s all about hope and, more importantly, the truth. I don’t think she’d just take the word of two villains at face value, even if one was wrapped up in the lasso of truth. What Nemesis believes to be true isn’t necessarily what happened, and Wonder Woman should be wise enough to know that. Instead, she seems to be shaken to her core. I’m no Wonder Woman, but I do know that if Veronica Cale told me anything, I’d automatically believe the opposite to be true. So from my perspective, the goods news here is that the Amazons must still be around. Themyscira might be in trouble, but the Amazons are resilient. I think they’re somewhere, if not in Themyscira than elsewhere, with Veronica’s daughter, too. If Wonder Woman won’t have hope, then I will! The story continues in two weeks’ time, with Jesus Merino and Andy Owens on art again. I’m not terribly excited for that after seeing this issue, but Cary Nord is set to be back in March. After a couple months off, I’m optimistic that he’ll return with some high quality art. And I’m confident that Diana will shake off her sadness and resume her search for the Amazons. Veronica Cale can’t be right! They’re somewhere, and Wonder Woman will find them, I’m sure. 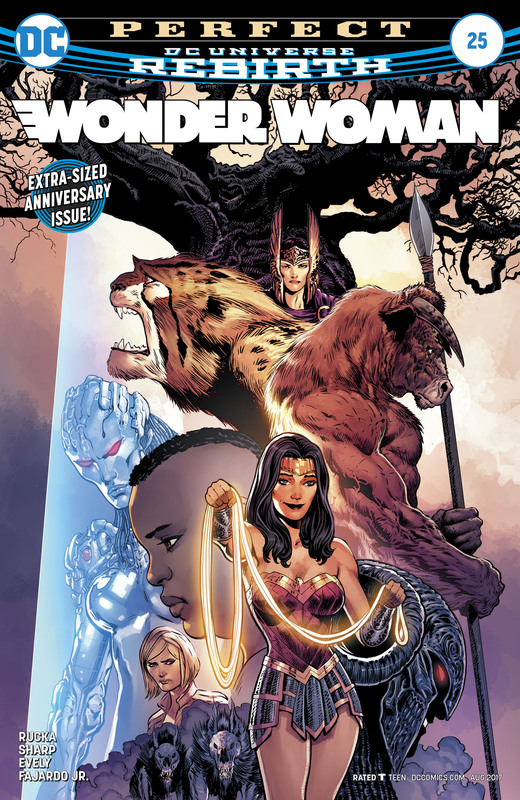 Wonder Woman #25 Review: The Grand Finale for Rucka, Sharp, Evely, and the Rest! I am about to reveal everything that happened in this issue! Also, go read it! It’s very, very, very good! This finale brings together all of the elements from this entire run, tying up the loose ends on some while leaving other plotlines open ended for future creators to explore. There are lots of references to past issues, including Wonder Woman’s first meeting with Batman and Superman from the recent Wonder Woman Annual #1; what seemed at the time like a fun, inconsequential one-off tale came into play here at the end. It’s a good example of what Rucka’s writing has done over the past year. Small beats had big ramifications down the road, and what seemed like tangents all added up to something bigger. I remember being frustrated with “The Lies” early on because it focused so much on the Cheetah, a character I’d just assumed was included as a quick initial foe for Wonder Woman, and took it’s time getting to the actual lies. But it turned out, of course, that the Cheetah was a pivotal player in this book, and that the slow burn at the start of “The Lies” laid a lot of the groundwork for everything to come. The master plan became visible only months later. So the finale begins with Wonder Woman in a bad mood, and understandably so. Her family remains lost to her, the Cheetah has escaped, her lasso is gone, and worst of all, her gods have been lying to her. She’s got some anger about it all, so much so that she’s punching villains extra hard and ignoring Steve. But some straight talk from her pals Batman and Superman sends her on a quest to find her gods, and they honour her anger. A speech from a mysterious woman who turns out to be Athena sets things right; she acknowledges that Diana is right to be angry, but that even with all of the manipulations of the gods, “The truth of you has never changed, Diana. Even the gods themselves could not take that away from you.” It fits in text, a nod to Wonder Woman’s steadfast heroism during the trials of the past 25 issues. But I think the moment stands as a larger statement about Wonder Woman, that no matter how many different incarnations of the character there are, some of them good and some of them bad, there is a core to her that shines through, an essential truth about her strength, compassion, and heroism that was imbued in her from her earliest days. The gods then return her lasso as a sign that they love her, and she leaves with a renewed belief in herself and her larger mission. She then finds Steve Trevor, and amorous activities ensue. I could be wrong, but I think that this might be the first time they’ve actually hooked up in text? It’s been implied at various times, but I can’t recall seeing them in anything like the heartwarming last page of this issue, with them in each other’s arms in bed. There was their kiss and the implication of something more during that night in the village in the Wonder Woman movie, but in the comics they dated from the 40s through the 80s, when they couldn’t show anything like that, and then Steve wasn’t a romantic factor for the next 25 years. With the New 52 relaunch, the romance was back but past. Now they’re actively together again, in ways I think we’ve never seen before. It works as a lovely end to the book, as a much deserved moment of love and happiness for Diana. Plus, Steve shaved for the occasion, getting rid of that god awful goatee, so it was a good scene all around! The finale leaves the rest of the cast in several interesting, open ended spots. Etta Candy, who’s been an absolute delight in this run, is going after the Cheetah, her former girlfriend Barbara turned crazed feline foe. This is a story I need to see. Their relationship was a background element that became increasingly important in terms of the Cheetah’s connection to her humanity. I hope that Etta getting Barbara back is a priority for a future creative team. The Cheetah’s a much more interesting character now as well, and I very much hope that DC stays true to Rucka and Sharp’s revamp of her in the future. And finally, my evil favourite, Veronica Cale. She’s the worst and I love her. Her backstory was so well established that we totally understand her full embracing of villainy now, and as much as it’s sad that she didn’t turn away from it, damn she’s a good villain. I’m going to miss Bilquis Evely drawing her so much. She brought such heart to the character throughout “Godwatch” and really sold the story through her take on Veronica. And here, Evely’s depiction of Veronica’s confrontation with Wonder Woman is just perfect. Her sneer when she refuses to help Diana is spectacular. Veronica Cale could be an epic villain for years to come, and I hope that DC embraces that and does her justice in the future. So we’ve reached the end of the run, and while I’m sad it’s over, I’m glad that Wonder Woman has been so well reoriented. I’m also sort of happy that Rucka and everyone decided to end things here. I’d have been down for more, but everything has wrapped up well and they’ve accomplished what they set out to do beautifully. Diana is in a good place, and is well positioned for new teams to tell exciting stories with her moving forward. I’m looking forward to Shea Fontana and Mirka Andolfo taking over the book for the next few issues, though I’m considerably less keen on James Robinson coming in after that. However, I’m optimistic that his run is just a bit of “Rebirth” housekeeping and that the New Year will bring a new team with a fresh perspective to the book. 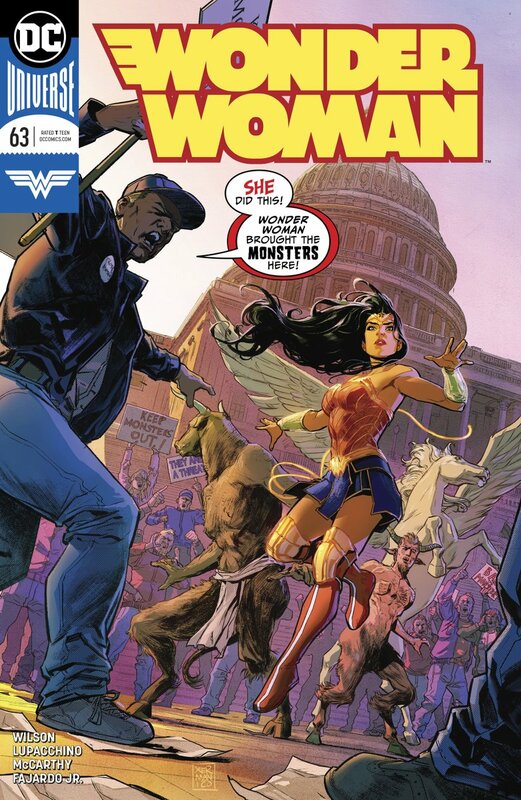 Rucka, Evely, Scott, and Sharp have demonstrated how amazing Wonder Woman can be, and it will be fun to see new voices picking up the baton from here on. I am about to reveal all of the key events of this issue! Also, if you haven’t read it yet, you should! This has been one of the best runs of Wonder Woman ever! So let’s run through where everyone is at, and how recent events have affected them. 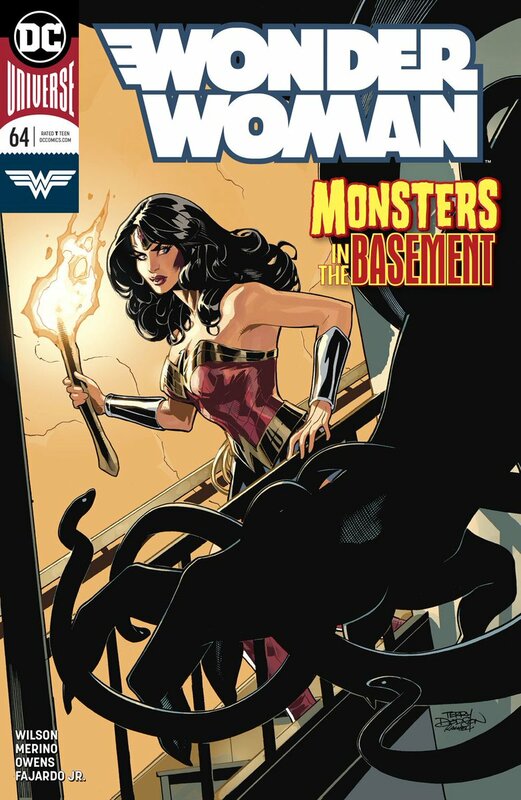 The last issue revealed that Wonder Woman must remain permanently separated from her home and her family, and the shock of that is clear initially. She leaves the island gate to Themyscira without tracking down the Cheetah, an uncharacteristic decision for her that suggests she was emotionally drained and perhaps overwhelmed by all she’d been through. She seems almost in shock when she returns to America, somewhat quiet and withdrawn, until Etta chastises her for leaving Barbara behind. Etta’s words hit her hard and shake her out of her fog, putting her back on track. Despite the weight of her tragic separation, Wonder Woman always cares for others more than herself and goes after Barbara. She finds her attacking Veronica Cale, which puts Wonder Woman in a difficult spot. She wants to help Barbara and she has so reason to care about Veronica Cale, who’s spent years trying to ruin both her life and the life of her friend. And yet, when Barbara promises she’ll go with Wonder Woman if she lets her kill Veronica, Wonder Woman refuses. She won’t let anyone die, no matter how guilty they may be. While tragedy shook Wonder Woman for a moment, she quickly returned to her heroic form, even though it meant another tragic loss for herself as her friend Barbara refused to go with her willingly. As for Barbara, her tragic loss consumes her entirely. And really, justifiably so. She’s had an awful time of things. She was restored to her true self, leaving her Cheetah identity behind, but then returned to her Cheetah form to help her friends in a noble sacrifice. Her rejection from Themyscira is the breaking point for her. She’d searched for the Amazons for her entire life and was close to them, finally, only to have the gate disappear. So she lets all of her anger and the sorrow over the many things she’s lost consume her. She goes after Veronica, aiming to kill her, and very nearly succeeds. Had Wonder Woman not intervened, Veronica would have been a goner. Then, even in the face of Wonder Woman offering her help and a return to her life with Etta, she refuses. We’ve seen a lot of Barbara as the Cheetah in these 24 issues, and while her feral identity often dominated her, Etta was the one thing that always gave her pause. But not now. The mention of Etta barely dissuades her at all, and she refuses to go with Wonder Woman unless she’s allowed to kill Veronica. The series of tragedies she’s endured were too much in that moment and overcame her true nature, though perhaps we’ll see things turn around for her in two weeks time with the grand finale. I’m not expecting a turnaround for Veronica. We’ve gotten to know her well this year, especially in “Godwatch” with Bilquis Evely bringing such life and emotion to the character. She was a woman who lost her daughter, an understandable motivation even though it took her to very dark places. But now her daughter is gone for good, and the weight of both her loss and her actions over the past year lie heavy on her. She’s lost her daughter, her company is in shambles, and she’s isolating herself further from the few friends she has. When the Cheetah calls her a villain, she doesn’t even flinch, as if she too knows what she’s become and is perhaps beginning to accept that this is who she is now. Tragedy has brought her emptiness, rightly so in many respects; she’s earned what’s coming to her. But however justified a punishment may be, the attack from Cheetah is especially brutal. Evely illustrates the horror of it well, from the gashes on her back to the violent action of the scene. And the most brutal moment of it all is the very end of the issue, with Veronica left all alone. Wonder Woman’s compassion and moral code saved her life, but her torn up body, left in solitude, stands as a monument to her inevitable tragic end. Well, the end for now. There’s one more issue to come, with Greg Rucka, Bilquis Evely, and Liam Sharp teaming up for a grand finale that will tie up all of the loose threads. I wouldn’t be surprised if we saw Veronica involved in some way, though if we don’t then this was a fitting conclusion for the character. It looks like Cheetah will be a big focus, since Wonder Woman knocks her out and takes her away at the end of this issue. With all of the mysteries solved and so much wrapped up already, I’m curious to see what the final issue will dig into. The conclusions of both the “The Truth” and “Godwatch” have been excellent and satisfying, so I’m excited to see how the creative teams decides to leave everyone moving forward. I am about to discuss EVERYTHING that happens in this issue! Wonder Woman #21 left us somewhat puzzled. The issue ended with Wonder Woman and Veronica Cale finding Ares, but he didn’t at all seem like the Ares we’d encountered in “Year One.” That first Ares was all angry bluster, decked out in armor while talking in fiery proclamations and demanding respect and obedience. This new Ares just looked like a pretty chill, friendly dude, so what was up? That mystery, and several others, were solved with this issue. We quickly learned that the first Ares was Phobos and Deimos impersonating their father, and that the second Ares was the true Ares, who’d been imprisoned beneath Themyscira all along. After he was consumed by war and driven mad, Aphrodite had locked up Ares in chains forged by Hephaestus and tasked the Amazons with watching over his prison. 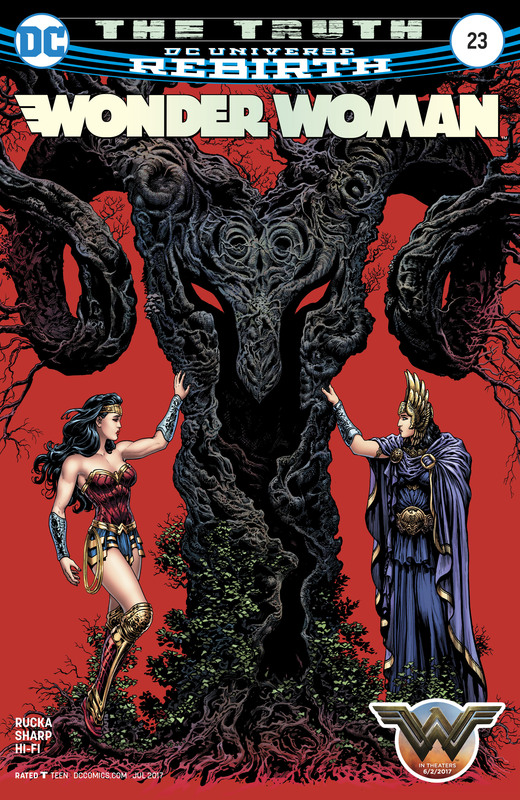 This was the first step in what became “The Lies,” or Diana’s false memories of her home after she left Themyscira; the location of Ares’ prison was such an important secret that the gods not only wiped away all memories of her true home but also created a false reality lest she seek to understand the hole in her memory. Ensuring that Ares was never freed again was paramount, and keeping the location of Themyscira hidden was key to that, thus the deception. But Wonder Woman isn’t a normal mortal, so of course she eventually realized that something was up. I like that despite all of the gods working together to create this elaborate ruse, Wonder Woman still found the truth. The gods feared her strength of purpose from the beginning and did their damnedest to keep her in the dark, and even against these odds she figured it out. Or, in short, nevertheless she persisted. Sounds like Diana to me. 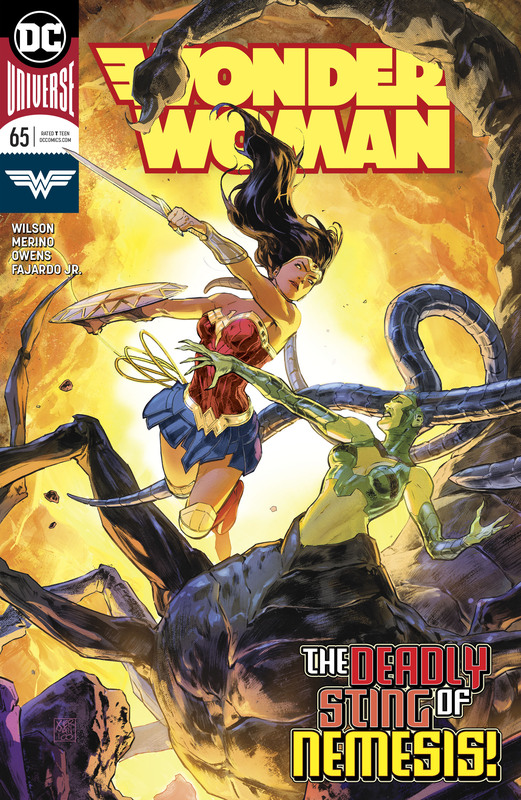 The revelations in this issue brought everything from the past year of Wonder Woman together tremendously well, and looking back we can see Rucka’s full plan unfolding. The truth behind the lies was a clever, intricately plotted mystery, and I can appreciate why it took so long to finally get the answers we were so hungry for when the book began. All four arcs weave together to get us to this point where finally everything makes sense. It was very well executed and smartly done, but beyond all of that it’s a conclusion that pays respect to Wonder Woman’s history and sets her on a new path that embraces key elements of her past. With Ares’s imprisonment and Wonder Woman’s handling of Phobos and Deimos, we see the Marston era’s focus on love and submission. Ares didn’t find peace through the binding of some magical chains; he found it through Aphrodite and her ability to see through his madness and love his true self. So too did love help Wonder Woman, as her compassion and forgiveness allowed her to overpower Phobos and Deimos, the embodiments of terror and panic. They came expecting a fight, and instead found an acceptance that they’d never known, which overwhelmed them and eventually freed them. And, just like their father wearing Aphrodite’s chains, this freedom came through binding, via the lasso in this instance. Meanwhile, the notion of Themyscira as a gateway and the Amazons as its guardians dates back to the Perez era. Liam Sharp underscored this reference when he drew the Amazons coming out of the water, just as they were created in the second Wonder Woman #1 way back in 1987. Both Nicola Scott’s and Sharp’s take on Ares were clearly inspired by Perez’s designs as well, and we can see similar touchstones with both of their takes on the Amazons. So we can see the Marston and see the Perez, yet at the same time this take on Wonder Woman is something new as well. Rucka’s borrowed old elements and reshaped them into a new status quo for Wonder Woman, the Amazons, and the mythos as a whole. We’ve still got a few issues to go, but at present it looks like the Amazons will remain separate and hidden from the outside world to keep Ares at bay. Phobos and Deimos may be defeated, but there is no shortage of fools who wish to unleash war upon the world. If the interaction between Diana and Hippolyta at the end of the issue is the last we see of them together for some time, it’s a heartbreaking and powerful moment to close on. And yet, there is hope. Because she was split between our world and Ares’ prison, Veronica’s daughter Izzy can’t re-enter the world. But since Themyscira is connected to Ares’ prison, she can live there among the Amazons. The daughter of Wonder Woman’s greatest enemy living with her family when she can’t is a brilliant stroke on several levels: On the one hand, she has what Wonder Woman desires most, but on the other hand she’ll be away from her mother and raised by her mother’s nemesis’ family. It’s a move that stings both Wonder Woman and Veronica, yet at the same time one they seem to know is for the best. Wonder Woman knows that Themyscira must stay hidden, and it seems that Veronica knows that perhaps she’s not the best influence. Furthermore, having a human girl among the Amazons maintains a link to the outside world, one that could conceivably lead to a larger reconnection some day. Overall, Rucka and Sharp have wrapped up “The Truth” very well and explained the major mysteries behind their run on Wonder Woman in an excellent fashion. There’s still a lot of story left to tell here, but the core question of the run has been solved in a clever, satisfying manner. I’m curious to see how everything shakes out over the next few issues before this run concludes. If this issue is any indication, Rucka and his fine artists will stick the landing nicely. I am about to delve into all of the details of this issue! Don’t read this review if you haven’t read the comic yet! Also, go read the comic! It’s very pretty! 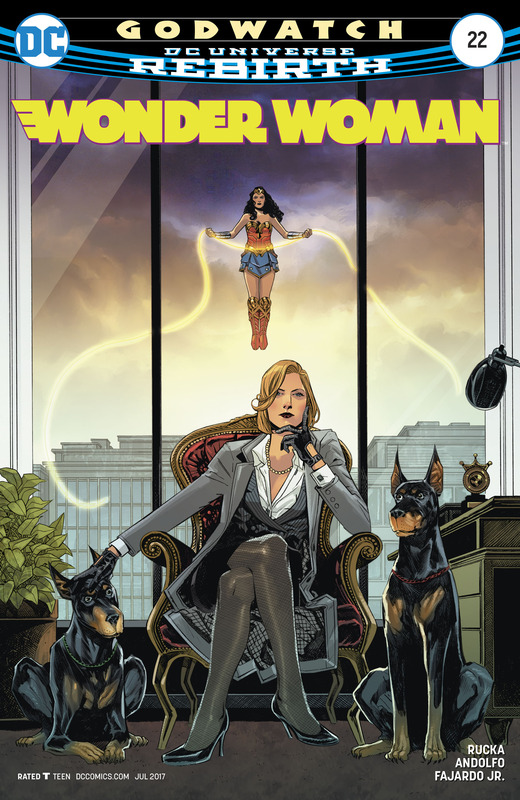 The last installment of “Godwatch” was a real corker, with Veronica Cale teaming up with Circe to use Wonder Woman to defeat Phobos and Deimos and get one step closer to getting her daughter back. This issue picks up a year and a half later, and explores the first meeting between Wonder Woman and Veronica. For some reason, I’d assumed that they’d met before; maybe it was all of the stories set in the present in which Wonder Woman knows about Veronica and her nefarious plans. I mean, they were hanging out in “The Truth” two weeks ago. My mental timeline probably got a bit screwy with all of the back and forth. Regardless, this is their actual first meeting, and it’s a very enjoyable one. 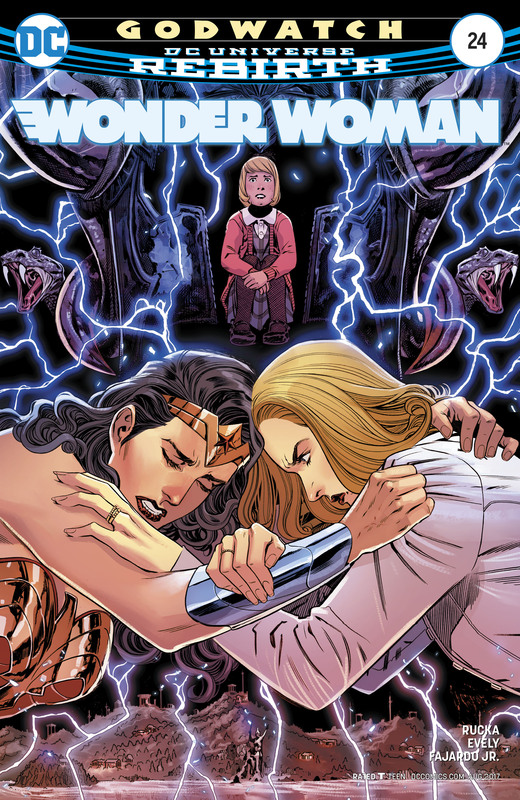 Between Veronica losing her daughter and the travails of Barbara/the Cheetah, there have been some very heavy moments recently in Wonder Woman. This is a much lighter outing, with a comedic set up, some excellent banter, and a nicely executed action scene. The heavy issues remain; Veronica’s daughter is still in peril and Barbara is the Cheetah. But the focus narrows in on Veronica and Diana engaging with each other for the first time on almost friendly terms. I loved that their meeting began at an auction in which Veronica outbid the likes of Bruce Wayne and Lex Luthor to nab a date with Wonder Woman (all for charity, of course). I also enjoyed that the extravagant event was followed by a more casual outing between the two as they got burgers in their street clothes. It was all quite cute. Well, as cute as a meeting between a heroine and her secret arch nemesis can be, I suppose. The issue also further fleshed out Veronica Cale, who Rucka is turning into an absolutely fascinating villain. Generally speaking, Veronica seems like kind of an amazing person. She’s a big supporter of the DC universe’s version of Amnesty International, a philanthropist generally, and a champion for the poor as well as gender and sexual equality. The more we learn about her, the more she becomes a fascinating tragic figure, a good woman turned to darkness because of the meddling of the gods. Before that, she was a tough businesswoman and not a big fan of Wonder Woman, but Phobos and Deimos interfering in her life and taking away her daughter is what turned her into a villain. Everything she’s doing is to get her daughter back, and it’s hard not to sympathize with that, even when she’s facing off against our favourite heroine. I’m hoping that she gets a happy resolution by the time “Godwatch” and “The Truth” wrap up. I know she’s done terrible things, but I feel like Wonder Woman would understand her motivations and try to help her fix them and start a new path rather than punish her. Time will tell. Now, onto Mirka Andolfo. The art in this issue is just great. Much like Bilquis Evely, Adolfo is excellent at crafting expressive characters, albeit with a very different style. There’s a lot of heart in this issue, and that works extremely well with the story it tells. “Two people getting to know each other when one is a secret adversary yet they both have an odd respect for each other” is a hard thing to communicate, but it comes across. Wonder Woman and Veronica’s issue-long conversation is a complicated dance from start to finish, and Andolfo hits all of the notes needed to make it work. Furthermore, she finally gives a modern take on Wonder Woman that feels young and fresh. We haven’t seen a lot of Diana in everyday clothes since “Rebirth” launched, and when we have it’s been fairly bland. Andolfo doesn’t go for anything extravagant or trendy here either, but by simply putting Wonder Woman in a tank top, jeans, and sneakers, her incarnation of the character feels like the most modern version of her we’ve seen in ages (and it’s of course beautifully colored by Romulo Fajardo Jr.; the guy just slays it with every single issue). Her outfit is what young women look like today, and that’s something I’d really like to see in Wonder Woman properties moving forward. Yes, she’s a superhero and that’s awesome, but when she’s not I think it’s good to see her as a modern woman so that fans, young and old, can better identify with her. As much as I am over the moon excited for the Wonder Woman movie, Gal Gadot’s fancy dresses in Batman v Superman and 1910s garb in Wonder Woman hardly scream “identifiable.” Part of making Wonder Woman modern and relevant is having her look modern and relevant, and I hope we see more of that soon, both in comics and on the big screen. Overall, this was an entertaining issue all around that sets us up well moving forward. First, the stage is set for the climax of “Godwatch” as the last page shows that Wonder Woman knows about Veronica’s more nefarious dealings. Second, the layers the issue adds to Veronica should make the climax of Rucka’s larger story all the more interesting; she’s a villain, but it’s hard to be too mad at her! And third, when Fontana and Andolfo take over Wonder Woman in July, I think we’re in for a treat. I can’t wait to see more of Andolfo drawing Wonder Woman! She’s a great talent, and the book looks to be in very good hands moving forward.